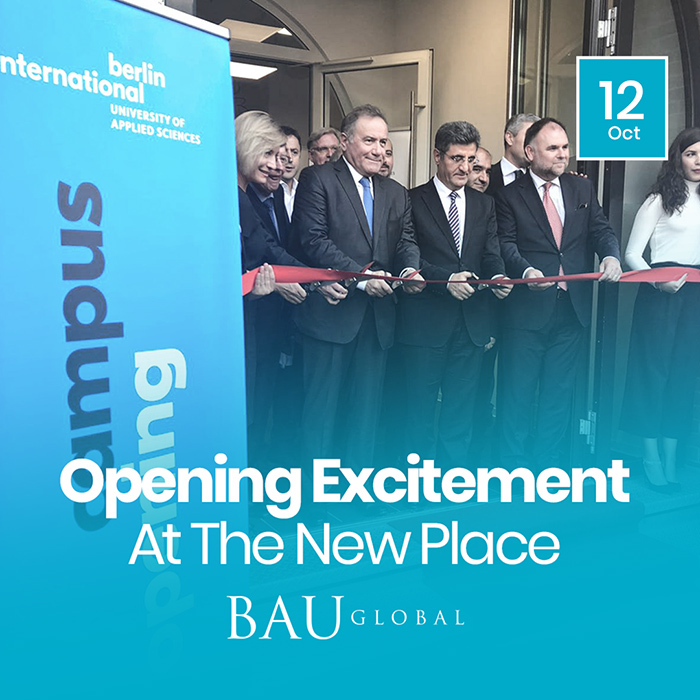 The Berlin International University of Applied Sciences opened its doors to over 200 guests on Friday, 12th October to celebrate the move into the new building at Salzufer. There were numerous board members from lots of associations such as the Turkish-German Business Association, the Association of Independent Entrepreneurs and also the Association of Turkish industrialists and business people present. In addition to those, the founder of BAU Global Education Network Enver Yücel, the Ambassador Ali Kemal Aydin as well as the vice chairman of BAU Global Network Coskun Ince enriched the event. The Opening ceremony began with a speech of our president Prof. Dr. Dr. hc mult. Hans-Dieter Klingemann and continued with further contributions by our student representative – Georgia Humphries, the Vice president of BI – Prof. Dr. Peter Mantel and also by the Director of UNESCO-European Centre for Higher Education – Jan Sadlak. The ceremony came to an end with the valuable speech given by Enver Yücel.